"Rounding one corner, a visitor will suddenly come upon the rear end of Engine 21 (“Keep back 200 feet,” it still commands), looking merely like an old fire truck that has seen a lot of action. A few steps more into the gallery, however, and it is revealed as a mechanical carcass. 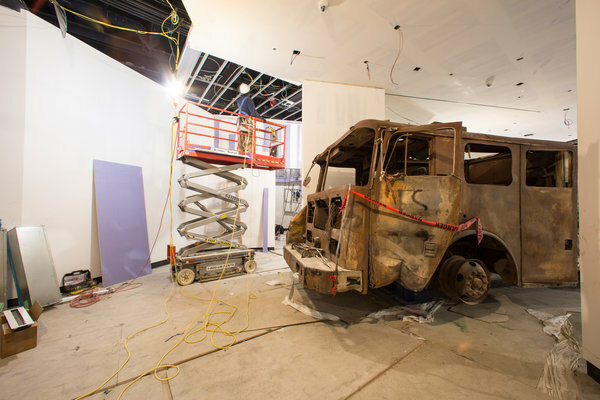 The cab, all its trim and livery burned away, resembles a skull. Transitions like this — by turns shocking and calming, distressing and heartening, awe-inspiring and grief-inducing — compose the memorial museum. Steven M. Davis, a partner in Davis Brody Bond, which designed the museum, said he and his colleagues had been guided by the principles of memory, authenticity, scale and emotion."